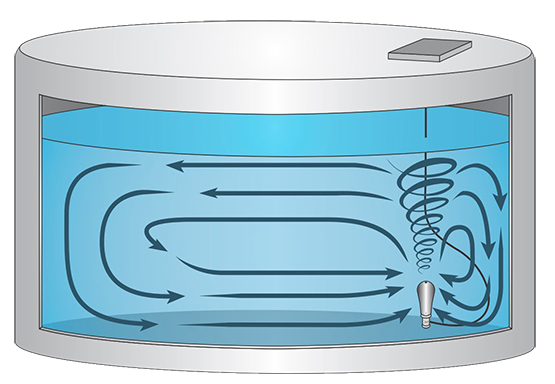 PAX Water’s jet mixers create a powerful vortex flow pattern inside small to mid-sized water storage tanks. Lightweight and compact, these mixers are easy to install and provide cost and labor savings, making it an economical purchase for utilities with a tight budget. The PWM100 uses a vortex nozzle to vigorously circulate the tank volume to eliminate thermal stratification, prevent ice formation, reduce residual loss and lower disinfection byproducts. The mixer can be installed by lowering it into the tank from the hatch and self-rights once it reaches the tank floor, even on a sloped surface.